Sadly it appears Flickr is disabling it's convenient sharing through Blogger facility. This means a bit of playing around with my blog is needed so I can carry on doing what I have been doing. Therefore this is a practice post so see what it will look like. I am so disappointed. I hate it when websites mess with the way things are done and take away things just because they don't make enough money. Don't get me started on how I felt when Google Reader was taken away. Right moan over. I am going to hit publish now and see what happens! This is one of my photos by the way. It was taken this weekend after a lovely day out in Brighton. We were stuck in traffic trying to leave so I just snapped away at buildings through the car window. 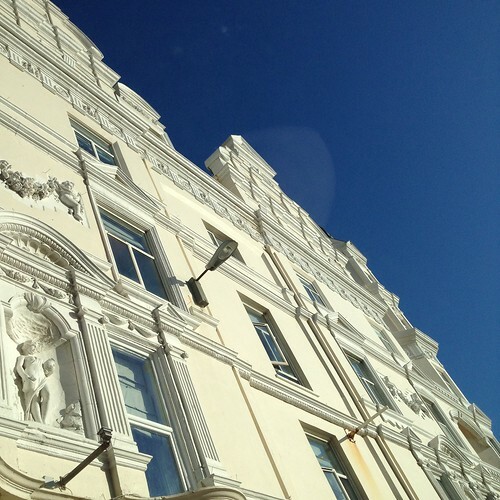 I love the contrast of the brilliant blue sky against the bright white building. Really lovely architecture too which I hadn't really noticed before.